My new installation Chromatic Variation 1 is now on view in the Limuw: An Ode to the Sea exhibition at CAF Satellite @ Hotel Indigo Santa Barbara. Kimberly Hahn, Chromatic Variation 1 (Detail), 2013, Site-specific installation at CAF Satellite @ Hotel Indigo Santa Barbara comprised of fabric dye, dowel rods, muslin, monofiliament, paint, plywood, and salt, Dimensions Variable (Installation approximately 98-1/2 x 108 x 72 in. ), Commissioned by Santa Barbara Contemporary Arts Forum, Courtesy the Artist. The inspiration for this piece is derived from looking at underwater photography texts as well as physics sites, which discuss how light is absorbed as one descends into the Ocean. Each wavelength of light is absorbed at a different depth in water with longest wavelengths, such as red, absorbed first. As a result the colors are absorbed from red to blue as they exist in the color spectrum. In addition, Oceanographic sites discuss the density of the water as well as the salt content increases as one descends. As each pouch is dipped into paint, the color absorbs into the fabric and minute salt crystals cling to the fabric as the wet liquid part of the colorant evaporates. 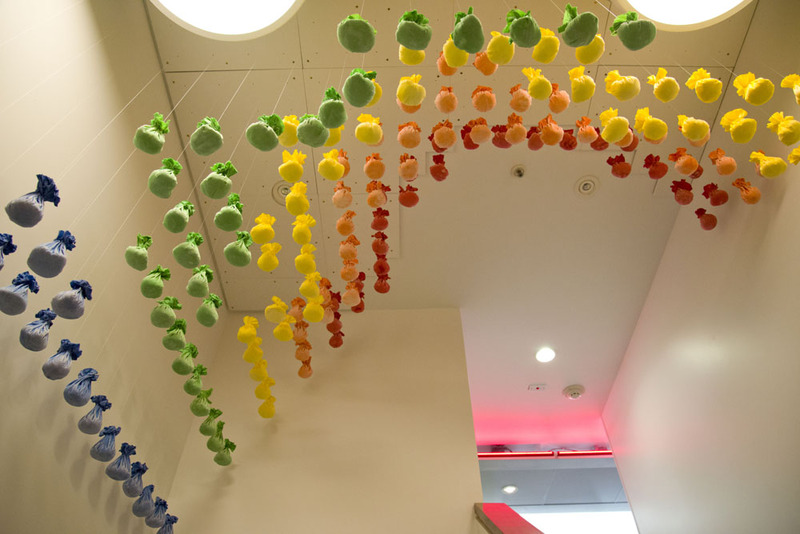 Hanging at different heights the colored pouches project a feeling of volume and weight while cascading at different heights from red to blue as the piece gets closer to the walls and crannies of the back stairwell. Though inspired by scientific phenomenon, this work takes an intuitive, poetic approach to representing the feel of being absorbed in liquid as salt saturates the experience and color becomes de-saturated upon descent.